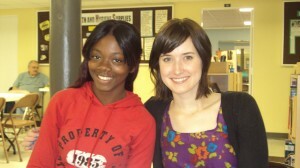 In 2006, the first HopeWorks Inc. student, Stacy Bell earned her GED. Since then many students have come to HopeWorks and completed their GED, but this year alone 26 students have already passed the test and now have earned their GED. What an accomplishment! Mrs. Susan, Ms. Anna, Mrs. Marissa, and Mrs. Emily love their students and work hard to inspire and motivate each and every one. Please continue to pray for the teachers and students as the number of HopeWorks Inc. GED graduates continues to grow.